What is the new service? The new service increases bin capacity by 140 litres over the collection fortnight when compared to the old service, and will meet the waste generation needs of the majority of households given correct separation. However provisions can be made for residents with additional waste management needs above the standard service. The 240L green lid food organics and garden organics bin (FOGO) is collected weekly, whilst the yellow lid recycling bin and red lid general waste bin are collected fortnightly on opposite weeks to each other. 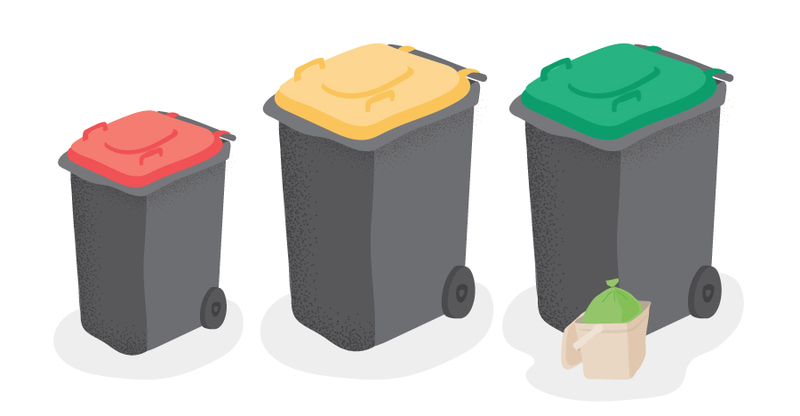 Ensure you place the right bins out on the right week by following the collection schedule. What are the benefits of the new service? Disposal of waste in landfill should be seen as the last resort. Waste generation in Australia is growing exponentially to population growth with 2 tonnes of waste generated for each Australian every year*. It is not sustainable to keep generating and disposing of waste at current levels and measures need to be implemented to address this. Wagga Wagga City Council's Community Strategic Plan 2040 identifies the need to manage waste proactively to meet the objective of creating a sustainable environment for future generations. This plan was developed as a result of significant community consultation. Council is committed to providing the best service to achieve both environmental and economic efficiencies. The diversion of food organics from landfill is the way many Councils are looking to do this and the establishment of a new contract provided the opportunity for Council to assess waste practices and look to continually improve on these for the future. Wagga Wagga is among a growing number of local government areas that have introduced a combined food organics and garden organics service. Many other council areas are working to introduce similar services as contract periods end. Wagga Wagga City Council has benefited greatly from the experiences of these other councils who have generously shared their knowledge with staff through the investigation and planning of this service. Waste that is placed in the general waste bin is sent directly to landfill, which is essentially burying waste in the ground. The buried waste decomposes in an environment without oxygen. As a result, methane pollution is generated and released into the atmosphere. Methane is a greenhouse gas 23 times more potent than carbon dioxide. Greenhouse gases contribute to climate change of which we are already feeling the impacts of. If organic material can be removed from the domestic waste stream and composted, the resulting material can be used as a soil enhancer for agricultural application or community parks and gardens. As composting requires oxygen, the main gas that is released in the process is carbon dioxide, which has a lesser impact on the environment than methane. Wagga Wagga City Council owns and manages the Gregadoo Waste Management Centre and the landfill cells that are contained at this site. The faster these cells are filled, the more frequently cells need to be constructed. A new cell can cost between $3-6 million and at current disposal rates a new cell needs to be built every 4 to 5 years. Reducing the amount of waste sent to landfill will reduce the frequency at which cells need to be constructed and reduce the frequency of significant financial outlay. A reduction of the amount of Food Organic and Garden Organic waste going into landfill in turn means Council will have less ongoing liability related to the monitoring and maintenance of the landfill cells. The NSW State Government may introduce a waste levy on landfill in our region. Metropolitan areas are already paying an additional $141.20 per tonne, and $81.30 per tonne for some regional areas, to dispose of waste in landfill. The aim of this levy is to reduce the amount waste being landfilled and to encourage recycling and resource recovery. A carbon price, or similar scheme, may be reintroduced in the future of which our landfill may be liable. Projections under the previous carbon price scheme and current landfilling rates indicated Council would have been liable to pay around $900,000 per year. Who will receive this new service? All properties that pay a Domestic Waste Management Service Charge receive the kerbside service. Residents under rental agreements within the collection area automatically receive this service as this charge is payable by landlords. If you are unsure if your rented property receives this service please contact Wagga Wagga City Council on 1300 292 442 or your rental agency.